PHILIP PRESTON, one of the 19 people charged in relation to a water charges protest in Jobstown in 2014, died last week after suffering a suspected heart attack. The 36-year-old father of one appeared in court on two charges of false imprisonment. It is understood his lawyers were hoping to have the charges dismissed at a pre-trial hearing on 17 October for lack of evidence. Preston had been present at the community centre where protesters surrounded the car which Joan Burton and her advisor Karen O’Connell were travelling on 15 November 2014. However, he told gardaí that he took part in a peaceful protest and did not stop the then-Tánaiste from leaving the area. He had attended the protest with his wife and daughter. He said he wanted to show support to the protesters and noted that the demonstration was held in good spirits. 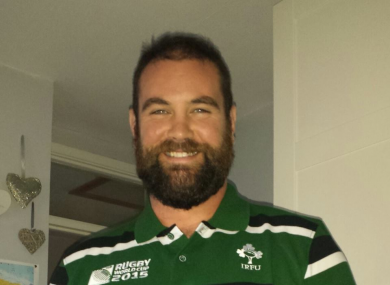 Named as Tallaght’s Person of the Year in 2015 for his work within the area’s youth rugby structures, Preston has been described as a ‘breath of fresh air’ and a ‘beacon of hope’. The community is in shock following his death last Wednesday, with Tallaght Rugby Club passing on sympathies to his wife Aoife and daughter Kayleigh. He played with the club but his most fruitful role was as its youth development officer. “Phillip was a man mountain with a heart of solid gold, his contribution to our club will never be matched on or off the field,” the club said in a statement. Its president, Ken Kinsella added that he was “completely devastated” that the talisman had been “taken so abruptly and unfairly”. “The whole community will never come to terms with this loss; everyone in the club is absolutely devastated. We, as a club, will come together and offer whatever support is needed to Aoife and the entire Preston family. There will never be another Philly Preston his boots are simply too big to fill. Speaking to the Irish Times at the Tallaght Person of the Year ceremony last November, he said the impending trial was “always on his mind”. “Hopefully if it goes all the way to court we will be found not guilty,” he added. Earlier this year, Philip spoke to TheJournal.ie about his voting intentions in the general election, noting his wish for the next government to protect the vulnerable. Philip was laid to rest on Saturday following a Mass in Tallaght village. He is survived by his wife Aoife, daughter Kayleigh and parents Philip and Rita, as well as his three brothers and extended family. Comments are closed as related court cases are still ongoing. Email “Jobstown protester, 36, dies of heart attack before hearing to dismiss charges”. Feedback on “Jobstown protester, 36, dies of heart attack before hearing to dismiss charges”.